All gardeners want to be green — except when it comes to water. Whether you have a fountain, pond or a small reflecting pool, chances are good that at some point you’ll have to deal with nuisance algae. To keep ponds clear, begin treatment early in the season, before problems arise. Mother Nature has a way of colonizing just about any watery habitat with algae — even a birdbath. Small amounts of algae may be a simple annoyance, discoloring containers with a film of green slime. In ponds, however, large amounts of algae can clog pumps and filters and harm fish. The best method for reducing algae growth depends on the size and type of the water feature, the time of year and the extent of the problem, as well as aesthetics and convenience. In general, it’s best to begin treatment early in the season — before problems arise. For details on algae-control products, read How to Keep Water Clear in Fountains and Ponds. Calculating capacities: A small fountain generally has a reservoir that holds 10 gallons or less. A container garden the size of a half whiskey barrel holds about 30 gallons. To calculate the approximate number of gallons in your pond, start by calculating the cubic feet: multiply length (in feet) x width x average depth. To convert cubic feet to gallons, multiply by 7.5. Barley straw is not harmful to fish and plants; however, straw does consume oxygen as it decays. If your water feature includes fish, be sure to use the proper product at the recommended rate and consider adding a fountain to help aerate the water. 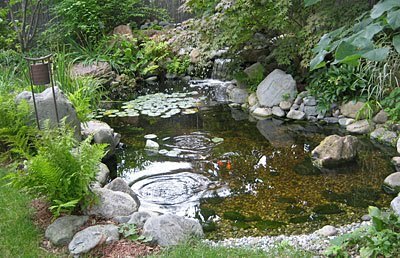 Pond Cleaners: Find the right solution for clear water in your water feature, including pond-cleaning vacuums, natural barley and enzyme-rich solutions. It is important work to keep pond clean in order to keep fishes and other creature exist. I like this tips for cleaning the pond. Really amazing information here!!!!! I’m surprised that I didn’t read anything on your post or on the other page that you linked to about Skimmers or Biofalls units. We’ve had a lot success using these items to keep ponds and water features clean. Having a pond or a lake in front of your landscape is a pure bliss. But maintaining the cleanliness requires a lot of hard-work. Kudos to you. You have brought out this topic to write on. Wonderful to read it.